Google Docs is such an incredible tool for college students, offering collaboration, portability, ease of use, and widespread acceptance. But there are so many options, both hidden and obvious, that there’s a good chance you’re not using Google Docs to its fullest capability. We’ve discovered 52 great tips for getting the most out of Google Docs as a student, with awesome ideas and tricks for collaboration, sharing, and staying productive. Access your documents from anywhere: Whether you’re in your dorm room or the school library, you can access your Google Docs. Take advantage of this to make it easy to do your work on-the-go. Use Docs reference tools: Take advantage of the Define option to use Docs’ built in dictionary, as well as a thesaurus and an encyclopedia available for use right in your document. Go mobile: Google Docs is available on most smart phones, and has a number of capabilities available on the go. Save to different file types: You can easily save your documents and spreadsheets to commonly used file types like DOC, XLS, CSV, and HTML. Use keyboard shortcuts: With keyboard shortcuts, you can speed through all of your tasks in Google Docs. Use templates: Google Docs has a template gallery for just about anything you can imagine, from an apartment bills organizer to a doc for organizing college visits. Convert PDFs to images and text: Use Google Docs to make PDFs easily editable. Create forms: Gather research information, ask for opinions, and more by creating Forms in Google Docs. Search EVERYTHING: Search through pretty much everything you’ve got by searching Docs and Gmail together, thanks to Gmail Labs settings. Autodetect links: Simply add links in Google Docs by having them automatically detected, instead of having to input full URLs. Adding video: You can embed video in documents, slides, and more to dress up your presentation. Insert photos with drag and drop: Instead of going through the process of attaching, you can just drag and drop files from your hard drive into the document, then wrap text around the photo. Create graphs: Visuals are great tools for getting your point across. Using charts in Google Spreadsheets, you can create your very own information-sharing graphs. Look up live finance data: In Google Spreadsheet, you can use special formulas to pull live information from Google’s finance service. Self-update spreadsheets: In addition to inserting live finance data, you can create a live link to that data for a document that constantly updates itself as accurate. Draw in Docs: Using Polyline, snap to guides, and other drawing features, you can easily create the images your documents need. Insert facts: Using Google Spreadsheet, it’s easy to insert facts, like the population for a city, which is simply pulled through the Google search engine. Simply add equations: Google Docs has found a way to make it easy for students to take notes in class, offering an Equations editor for adding equations onto your pages. Embed Docs anywhere: Get a link to your document or spreadsheet, and you can embed or publish it anywhere, including Facebook or a class blog. Just share: Get the ball rolling on collaboration through Google Docs by sharing your document through email links. Turn it into a webpage: Download your document in HTML, and you can share it as a webpage with a minimal amount of hassle. Chat away: In Google Docs, you can see anyone who is currently editing the document, and if needed, send a message to chat with them. Team up with anyone: Using Google Docs, you can collaborate on a document with friends, classmates, and professors. Share an entire folder: If you’ve got a collection of documents to work on together, just open up a shared folder that everyone can access. 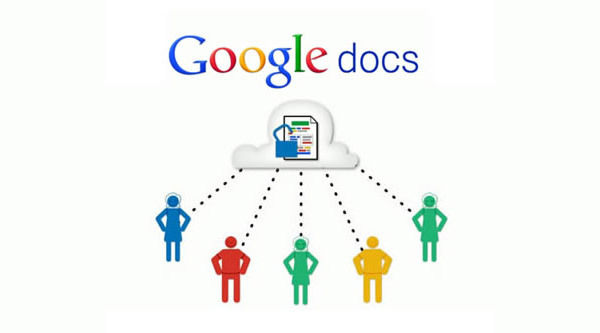 Work on documents all at the same time: Google Docs allows users to simultaneously work on a single master document, so you can come together with other team members and professors to work on a document at the same time. Allow editing without signing in: If you’re sharing a document with classmates who don’t have a Google login, just make it available to edit without signing in. Track visits: Using Google Analytics, you can track how much traffic a published document is receiving. Set notification rules: Find out about the changes made by your collaborators on any given document by setting up notification rules. Use Docs instead of emailing attachments: Rather than emailing revised versions of documents over and over again, you can just use Google docs and see revision histories. Kick slackers off of a project: Simply remove collaborators doing more harm than good by clicking None next to their name. Freeze to stop editing: If you’ve perfected certain rows and columns in your spreadsheet, just freeze them so they’re not accidentally edited. Revert back to old versions: If your group doesn’t like a certain set of changes made, it’s very simple just to revert back to automatically saved previous versions in the revision history. Save brainstorm notes for group projects: Get everyone’s ideas all together in one place by using Google Docs for brainstorming. Use data validation: Make sure that your collaborators aren’t adding a mess to your spreadsheet by using data validation on shared documents. Use color coding: You can change text colors based on rules, like setting green for one classmate, blue for another, and red for yourself. Clean up your main Google Docs page: Move items to individual folders, and you can make your landing page a lot cleaner and easy to navigate. Insert a bookmark: Make it easy to access other parts of your document, like a table of contents, by inserting bookmarks throughout. Create subfolders: For an extra step of organization, create folders within folders. Get color coded: Color code the names of your folders for quick and easy identification. Get synched: Using tools like Syncplicity, you can get all of your Google Docs synched up with documents from Microsoft Office. Create your own shortcuts: Put together shortcuts to launch Google Docs, create a new document, and even access frequently used documents in a flash. Print multiple Docs at once: If you need to speed through printing several documents at one time, just download and open them as a zip file. Quick View PDFs: When you see PDF files in search results, you can just Quick View them to open them up in Google Docs. Check your translation work: Google Docs has added a translation tool, which can easily be used to double check your work when writing a foreign language essay. Get a grade before you turn assignments in: Using Flubaroo on Google Docs, you can get quick feedback on your assignment, giving you a chance for improvement before you need to turn it in. Write in full screen mode: Make your toolbar, menus, and other tempting distractions disappear by displaying your Google Docs in full screen. Automatically correct your common mistakes: If you have words that you just can’t spell to save your life, set up a preference to automatically find and replace your mistakes with correctly spelled words. Customize your styles: If you like a consistent look for your documents, set up a customized style so you don’t have to go back and fix it with every new document. Work offline: Use the offline feature of Google Docs to work on the bus, plane, or anywhere you plan to go without an internet connection. Save web pages to your Google Docs account: Turn any web page into a PDF for viewing later by using the send to Google Docs extension for Chrome. Back it all up: Google Docs itself offers a great way to back up your documents, but it never hurts to save elsewhere, right? Back up and download all of your Google Documents and save them to a hard drive for safekeeping. Use Google Docs for everyday stuff, too: You can use Google Docs to track expenses, maintain your calendar, and more. This article was first posted in Online Colleges.